The internet is filled with claims that the Hindenburg’s “flammable covering” was the main reason the ship was destroyed by fire in less than a minute. 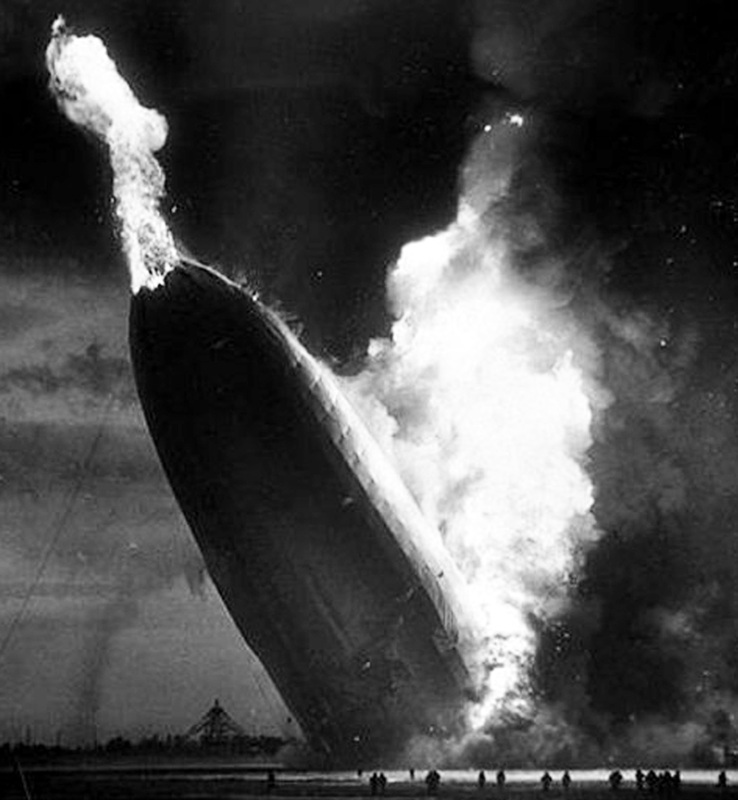 In fact, the Hindenburg was only the last in a long line of hydrogen airships destroyed by fire as a result of their highly flammable lifting gas, and scientific studies show that the Hindenburg’s covering might not have been flammable at all. For a detailed historical and technical analysis, visit Rocket Fuel, Thermite, and Hydrogen: Myths about the Hindenburg Crash. But perhaps the most obvious and compelling evidence is found in the films and photographs of the disaster: Even as the hydrogen flames roared around the covering, the covering itself did not burn right away. Even with flames right behind the covering, the fabric itself did not not immediately ignite. Instead, the fabric burned from behind, where the hydrogen fire was roaring. And even as the zeppelin crashed to the ground, with flames erupting from its nose like a blow torch, the covering had not yet burned: Flames fueled by hydrogen reached the airship’s nose, killing the crewmen stationed in the bow [see diagram], long before the covering on the hull caught on fire. Airship historian Patrick Russell has suggested that readers pay especially close attention to the following two portions of the film. The final proof may be this: Even after a fire so intense that it took less than a minute to destroy an airship the size of almost three football fields, some sections of the covering never burned at all. Whether the Hindeburg’s covering was sufficiently flammable to have been the initial source of ignition may be open to reasonable debate. 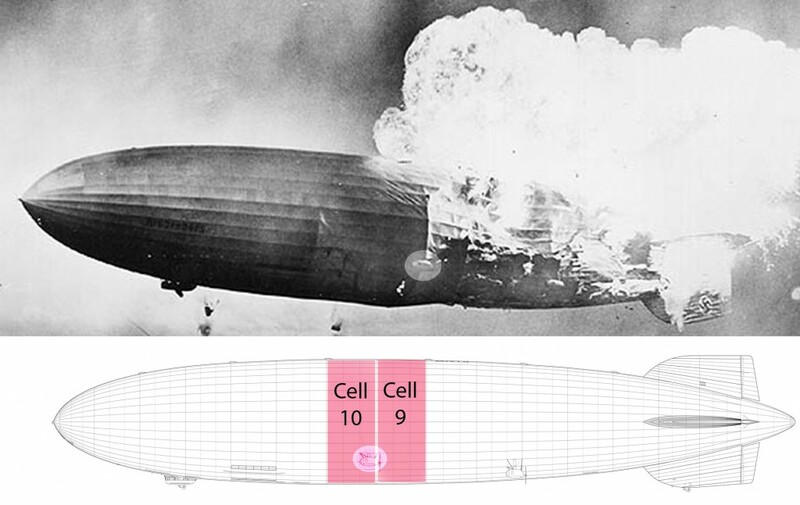 It is possible (although not likely, given the rainy and wet conditions) that the covering was the cause of the initial ignition, but if the Hindenburg had been inflated with helium instead of hydrogen, even a small fire on the outer covering would not have resulted in a major catastrophe. Hydrogen is a highly volatile, flammable gas under all conditions, and when mixed in certain ratios with air it is even explosive. Claims by hydrogen fuel cell advocates that hydrogen was not responsible for the Hindenburg’s ultimate destruction are nothing less than silly. For a detailed analysis of Hindenburg’s covering, visit: Rocket Fuel, Thermite, and Hydrogen: Myths about the Hindenburg Crash. And for detailed background about the accident in general, visit: The Hindenburg Disaster. But for a basic understanding of the “rocket fuel” argument (sometimes called the Incendiary Paint Theory), you just need to look at the films of the crash: If the Hindenburg had been painted with anything as flammable as rocket fuel, its covering would have burned rapidly during the fire, but that simply did not happen. I worked at Goodyear aircraft(later aerospace) from 1952 to 1980 I was told by older engineers that sparks at large dia trim valve surfaces opening and closing started the hydrogen fire. Ballasting methods were tricky. i think this is completely true although i think its a shame that the world totally wrote off any kind of airship after that, the helium ones are actually quite reliable athough slightly more expensive…. I was wondering what the two large objects were that appeared to fall from the Hindenburg during the initial stages of the fire. I am guessing that they were ballast tanks. Please let me know. thanks so much for this information. have you seen the mythbuster episode where they figured out what made it crash.